I’m still rather new to the hunting scene, but my brief perusal of the NY State Fish and Game Laws tells me one thing. 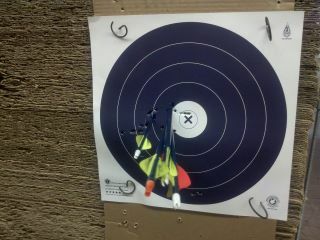 About six months ago I fooled around with a bow at a local archery range/proshop Pro-Line Archery. Had a good time, the Managers, Joe and Guy are seriously incredible bowmen. Guy’s daughter taught me how to properly stand, draw, and shoot bow. Last night after work, I took MTA about an hour out to Ozone Park to see what kind of bow would suit my needs. After chatting with Guy, Joe, and Neil for a while and drawing a few bows, I rented one of their bows to send a few arrows down range. Lot of similarities between bow and shooting rifle offhand. If you do the same thing again and again, the arrow/bullet will go in a similar place every time. Funny how that is. As a novice, bow is harder, as the “lock time” for a bow is very long relative to a rifle. This means that follow through is even more important with a bow than a rifle. Following the range trip I touched base with a few of my hunting mentors for bow advice. All the advice was pretty similar: Buy a nice Matthews, Hoyt, or Bowtech and just shoot it. So I’ve got a Cabela’s arrow block and hunting pack on order and I’m pricing out a good set up.